M&Ms... candy corn... Reese's peanut butter cups... and Almond Joy bars. Do you have all of those in the UK? Strawberry bonbons definitely. I loved the way all the strawberry flavoured frosting would melt in my mouth! Beautiful outfit Roz - particularly the trousers, the tailoring is so perfect they could have been made for you! I love the idea of finding inspiration in something like sweets, my favorite are homemade peanut butter cups and hard butterscotch candy. The colourful striped blouse really ties this look together, great eye as usual! so cute to see the inspiration behind the outfit! that jacket is definitely too sweet:) I love it paired with those pants too, you look so tall! I love your candy inspired outfit. I love finding inspiration from everywhere around me. I always have loved ice cream, pie, and brownies. Those two are my favorite sweets to eat. i just love those traditional sweet shops & somehow if they're wrapped in old-fashioned packaging, they just taste better! pearl is recent discovery of mine, yours & her words on the blogging community really ring true. I know pearl and the kindness to bloggers. isn´t it fantastic????? They do not sell liquorice allsort in Spain, thankgod or I would be a few pound fatter. hehehehe. 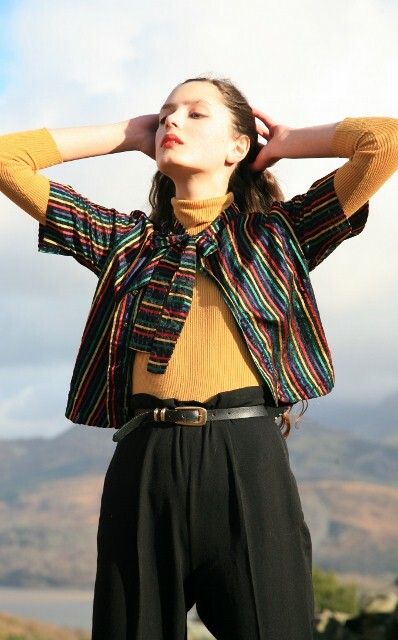 Love your liquorice allsort top and your alway dreamy photos. Have a wonderful Sunday Roz. I've been after a pair of trousers like these for ages - I love the cropped length. You look fantastic! Allsorts win hands down for me!! It is funny because I never liked them when I was younger, but my mum always loved them, she still does, and only a year or so ago I decided to give them a try and I am hooked. They are my absolute favourite now. beautiful photos, and i love the rainbow top! You have a real knack for styling outfits. Looks great, Roz! My favourite sweeties were, and still are, fizzy cola bottles. They are sweet and sour and awesome. Hi Roz, you look amazing, you really do know how to work your body to take a great picture. I really hope you reconsider a career in modelling, I think you'd be amazing. You seem so much more alive in the shots than a lot of the new models on the scene. I love this outfit inspiration, I'm a huge fan of good old fashioned toffee, the kind you need a hammer to crack. It reminds me of Christmas with my father and his brand new special box of toffee that was a gauranteed gift for him every year. Great post! I'm not to keen on liqorice myself though! It would have to be strawberry chews (I don't think they have a name). You're writing is Amazing. I love the first image, and the scenery is beautiful! Thanks for the fab comment and finally I've got a new post up! This post definitely reminds me of Chitty Chitty Bang Bang, one of my favourite childhood movies. also, I just started blogging so I'm happy to know that I'm entering into a welcoming world. Your blog is amazing! Thanks for sharing! 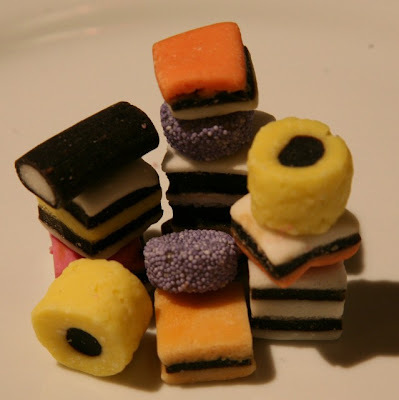 Licorice Allsorts are the best looking sweet aren't they, even though they taste horrid. I love the way you've put this together, I used to have a Paul Smith shirt that was very similar so your gran was ahead of her time! CANDY! CANDY! CANDY! YUUUMMMM!!!!! =D I actually loooove those licorice candies upon which your outfit is based...I also am a sucker for anything chocolate peanut butter, or anything sour and tart. your outfit is beautfiul! i love the brilliant jacket and flowing hair! So stunningly beautiful! Twix bars - caramel, chocolate, cookie all in one. And eh, I still love love LOVE candy, haha. Love the liquorishe theme - you look gorgeous! have you seen this in elle?!! My candy taste hasn't really changed since I was little... I was, am and always will be a gummybear kind of girl. By the way, as a new reader, I have got to say that I absolutely adore and enjoy your writing - after a long day of work, it is a nice way to come down from all the stress and just start musing about your thoughts. You're an inspiration yourself!